Did you know fleas have been around for about 165 million years and that one female flea can lay around 2,000 eggs in her lifetime (2 - 3 months)? These tiny parasites are a nuisance to control, but without proper treatment, your pet and your home can quickly become infested. Plus, fleas can pose health risks to your pet. In this post, we will cover some flea facts, how to tell if your dog has fleas, the types of flea collars, how they work and the common ingredients used in flea collars. Plus, we'll also review our top three picks for the best flea collar for dogs on the market today. Let's "jump" to it! There are many ways to tell if your dog has fleas. The most obvious sign is you can actually see the fleas moving about on your pet. However, fleas are very quick to catch, so you will probably notice pepper-like dirt on your dog's skin. This is actually the feces the fleas leave behind. Another sign of your dog having fleas is he is scratching more than usual. This can include around his ears and head region. Your dog may also be restless and licking or chewing at parts of his body. If this happens, check for those nasty biting pests. The first place to check to see if your dog does indeed have fleas is behind his front legs (armpits) and in the groin region. These are the warmest parts of your dog's body and the most protected, so fleas will hang out there to stay safe. You will also want to check for redness and blood on your dog's skin, as these two signs can indicate flea bites. What Are Flea Collars and How Do They Work? A flea collar is a thin strip of plastic made with a mixture of insecticide and resin to either repel or kill the fleas on your pet. Repelling collars - emits a gas to ward off the fleas before they actually jump onto your canine companion. Treatment (kill) flea collars - uses a pesticide that either seeps into your dog's skin and works by killing the flea after it bites or will emit the active ingredients that kill the fleas on contact. 1. Deltamethrin (delta-METH-rin) - classified as one of the safer insecticides, Deltamethrin is a synthetic Pyrethroid of a naturally occurring pesticide called Pyrethrin, which is found in the chrysanthemum flower. 2. Amitraz (AH-mih-traz) - although the specifics of how this pesticide works is still a mystery, it is effective as an antiparasitic drug. 3. Pyriproxifen (pie-rih-PROX-uh-fen) - this pesticide works by sterilizing the fleas so they are unable to reproduce and targets both the eggs and the larvae. 4. Propoxur (pro-POX-ur) - this pesticide will cause nervous system damage in the flea and within 24 hours they will be dead. However, be aware that this pesticide is toxic to humans so always wash your hands after handling a flea collar with Propoxur in it and keep it away from children. This flea collar both repels and kills fleas up to 7 months, along with the eggs, therefore stopping the cycle on your pet. This is all made possible with the Reflect-X Shield that also reflects light up to 450 feet for extra safety on those night time walks. The Hartz UltraGuard Plus collar is an inexpensive alternative to drops or pills. 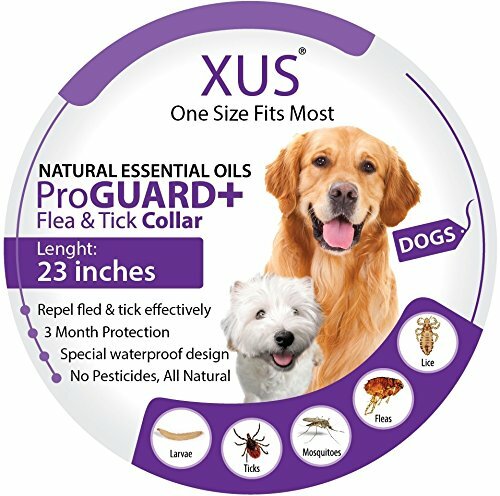 The two main concerns with this flea collar are the odor the pesticide emits is quite strong and the buckle on the collar tends to be weak in nature. This all-natural flea collar for dogs not only repels fleas and ticks but a whole host of other biting insects. It is 100% waterproof so you don't have to take it off your canine companion when bathing him or on those outdoor rainy days. In addition, this flea collar is effective under normal usage for up to 90 days and one size fits all (just trim off the excess). The one thing that may be a concern to pet parents is this product is a bit pricey. 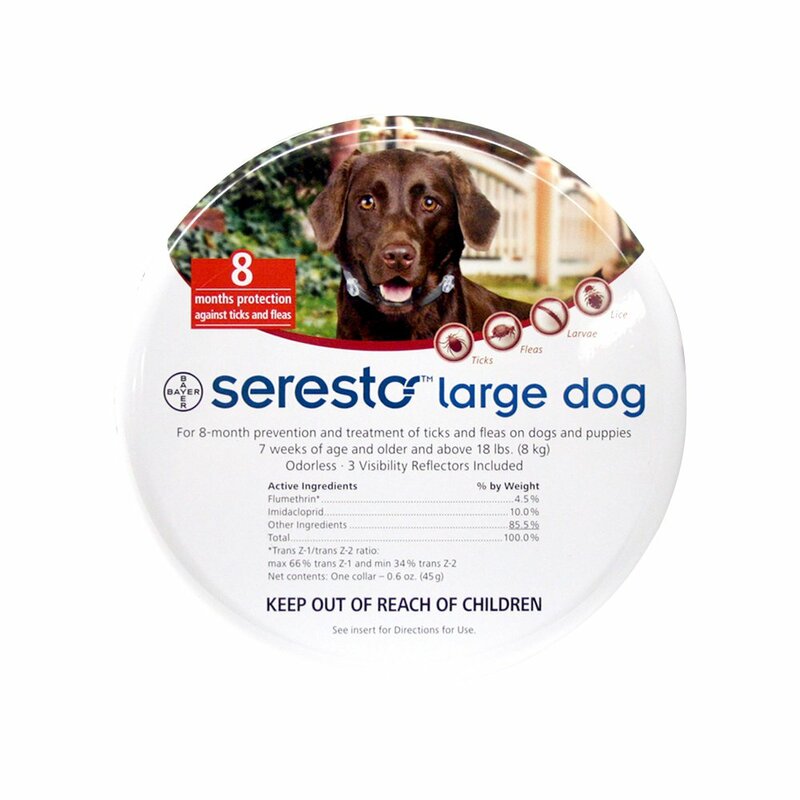 The number one spot for best dog flea collars goes to the Seresto product and here's why. 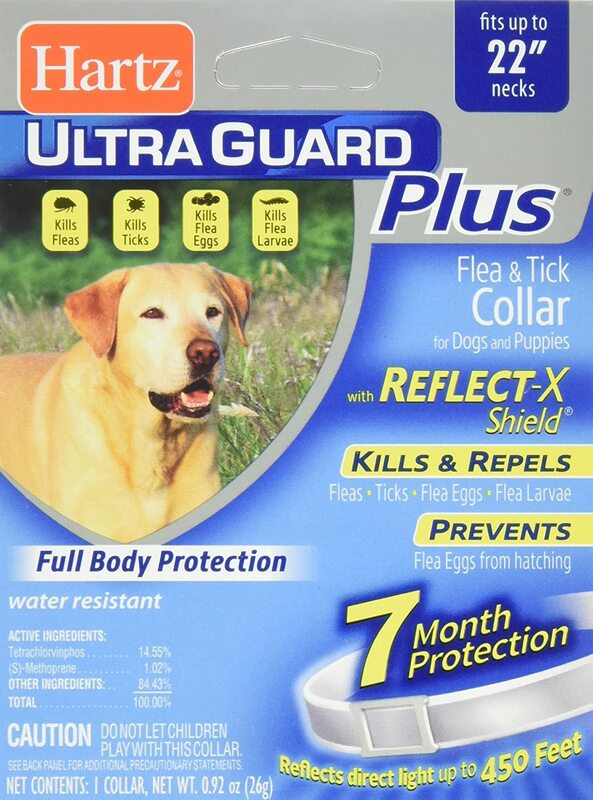 This brand of flea collar kills these nasty pests up to 8 months. The collar is waterproof for those pooches that love to swim or play in the rain and it is also odorless and non-greasy - no more stinky flea collars with Seresto. In addition, this collar is purchased to fit so it also comes in small for dogs 18 pounds and under or fitting a neck size of 15.5 inches. The one concern that may come up is this brand of flea collars for dogs is quite pricey.